The former Netherlands coach made the admission after Laurent Blanc, manager of the Ligue 1 champions, told reporters on Sunday a deal to sign the 27-year-old was "very close". "We still need more speed in front and also more creativity. That is why I hope di Maria shall stay. But we don't know that." "There is a good possibility he could sign but there is nothing official," he added. "We have to have patience a little longer. The outcome is very close." 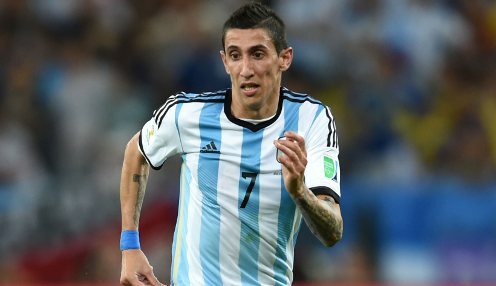 Argentina forward and club-record signing di Maria has not joined United on their pre-season tour of the USA and French newspaper L'Equipe has reported the former champions have agreed a £46.5million deal with the capital giants. Van Gaal said he did not want to lose di Maria because he is the type of player United need to be realistic challengers in the Premier League and Champions League. He told reporters: "I can give examples of champions: Bayern Munich, Ribery and Roben; Chelsea, Hazard and Willian; Real Madrid, Ronaldo and Bale; Barca, Neymar and Messi. "Manchester United fans want us to compete with these teams." Di Maria was signed last summer from Real Madrid but scored only three goals in the Premier League in his debut season and reports have suggested his family have failed to settle in England. Van Gaal added: "We still need more speed in front and also more creativity. That is why I hope di Maria shall stay. But we don't know that. "Ashley Young and Juan Mata had fantastic seasons, with assists and goals but to win the Champions League you need speed also. That is why I think, maybe, we still have to buy a player with speed and creativity." Manchester United are currently priced 1/1 to win next season's Premier League and quoted 1/1 in the Champions League outright betting.